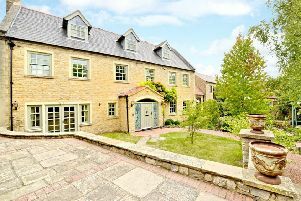 This pretty Grade II listed former vicarage is set over four floors with six bedrooms arranged over the first and second floors and a laundry room/cellar on the lower ground floor. The property is on the market with Michael Graham for £1,275,000 and is located in Ravensthorpe, Northamptonshire. If you like period features then you’ll fall in love with this property as exposed stonework, flagstone flooring and multiple original fireplaces give a sense of history and character to this substantial family house. At the heart of the home, the beautifully designed kitchen has handmade wooden cabinets from Smallbone of Devizes and an oak breakfast bar. A lovely room to relax in, keen chefs can also rejoice as it’s impossible to run out of oven space here – the kitchen island has integrated twin ovens and a gorgeous Aga nestles neatly in the chimney recess. High ceilings make the whole downstairs light and airy and the three reception rooms all have fireplaces, wooden flooring and access to a terrace overlooking the garden. The family room and dining room have French doors and the sitting room has a full-length Georgian sash walk-through window. Outside, the garden is secluded and mainly laid to lawn with well stocked borders and mature trees and shrubs. There is also a vegetable garden. If you’re after a property with money making potential, then The Old Vicarage could well tick that box: two detached barns in the grounds - one of which housed the village Sunday School until 1961 - have scope to be converted to residential accommodation. Located midway between Northampton and Rugby, the village of Ravensthorpe is well served by a shop, primary school, pub and church. What’s more, the county’s hidden gem of Ravensthorpe Reservoir is just a short stroll away and the perfect place for a spot of fishing or bird watching. Plenty more amenities can be found in the market town of Northampton ten miles away, including a station with direct trains to London Euston taking 46 minutes. For viewings and more information, contact Michael Graham on 01604 611011 or visit michaelgraham.co.uk/property/rps_mig-NOR180414.